Mort Künstler Hand Signed and Numbered Limited Edition Giclee:"The National Game (White House 1862)"
Edition Size: Artist Signed and Numbered with COA to 304 Total editions. Image Dimensions: Limited Edition Print Image size: 14" x 26" / Overall size: 19" x 30" Canvas Sizes: 15" x 28" , 20" x 37", 24" x 44" and 31" x 57". About the Edition : It is considered America's national pastime, but more than just a mere sporting event, baseball has become an important part of the fabric of American history. Therefore, it somehow seems fitting that the origins of modern baseball can be traced back to a divided America, when the country was in the midst of a great Civil War. Despite the political and social upheaval and the expressions of grievances that resulted in the separation of the North and South, both sides shared some common interests, such as playing baseball. Throughout the war, countless baseball games, originally known as "Town Ball," were organized in army camps and prisons on both sides of the Mason-Dixon Line. Although these early forms of baseball had already become high society's pastime years before the first shots of the Civil War erupted at Fort Sumter, it was the mass participation of everyday soldiers that helped spread the game's popularity across the nation. Regardless of its location, whether in prison camps or in the field, baseball provided an escape from the harsh realities of war and ultimately improved the morale of troops who were obviously homesick, scared, and in some cases, traumatized by the horrors they had witnessed on the battlefield. After the war ended, many men from both sides returned home to share the game that they had learned. Eventually organized baseball grew in popularity and helped to unify a country that had been torn apart for so many years. Battlefields were not the only ball fields of note during the war. In the autumn of 1862 Union soldiers played the game on the lawn of the most famous house in the country. Mort Künstler's Comments: At the conclusion of the 150th anniversary of the Civil War, I announced that I had retired from painting the Civil War-and I meant it. Then I learned about the event depicted in my newest painting: The National Game. It depicts an early baseball game played by Civil War soldiers on the South Lawn of the White House. Here was a captivating, historic scene from the Civil War and an important early event in baseball. I had to paint it! My Long Island neighbor, Gary Pasquaretto, commissioned me to paint a Civil War era baseball game. As I researched the topic, I contacted my dear friend Dr. James I. Robertson - the dean of Civil War historians - and the gifted sports historian George Kirsch, who authored the fascinating book Baseball in Blue and Gray: The National Pastime During the Civil War. I also learned a lot from my friend and historian, Michael Aubrecht, who is an authority on baseball. Michael introduced me to the very knowledgeable senior curator at the National Baseball Hall of Fame in Cooperstown, New York, Tom Shieber. Tom's comments were invaluable in helping with the painting's historical accuracy. I was surprised to learn that Northern prisoners of war at North Carolina's Salisbury Prison sometimes played baseball with their Southern guards. This led me to learn about other baseball games that occurred within the ranks of Northern and Southern troops during the war. 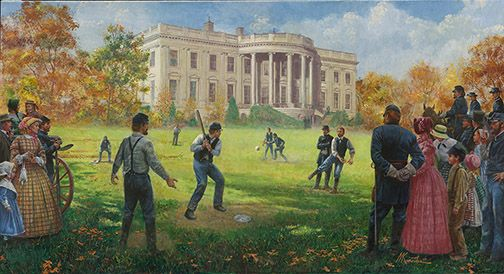 The historical event which really captured my imagination and led to the creation of this painting was a baseball game played by Northern soldiers on the South Lawn with the White House as a backdrop. According to Evan Phifer, the senior historian with the White House Historical Association, Northern troops posted to Washington, D.C. during the Civil War often played baseball outside the White House. One soldier team even called itself "The Washington Nationals"! For the painting, I chose to depict a spirited game played by soldiers during the autumn of 1862. Early baseball pitchers threw underhanded - as if they were pitching horseshoes. Umpires were not yet required to stand behind the batter, so I took artistic license and placed the officer-umpire behind the pitcher to give the painting a military look. Catchers wore no protective gear and the players didn't even wear baseball gloves. To me it was so American! Early baseball action, Civil War soldiers, and the 1862 White House as a backdrop - what an amazing scene from our national story! No thank you, I just want the 19x30 unframed SN Giclee print.